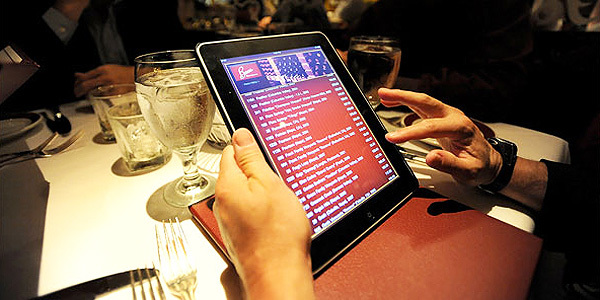 • News that restaurants are swapping doorstop wine lists with iPads, all loaded up with their list, reviews, winery information and inevitable Robert Parker scores. See (in descending order of interest, but all on-topic) here (from yesterday’s New York Times) and here (The Economist, today) and here (Jancis Robinson, a couple of weeks back) plus, from a few months ago, here. • Michel Rolland says something predictably provocative, suggesting wine should be more like Coke – designed to taste predictable, but with flavours deliberately altered according to the target market. “Here in France, and particularly in Bordeaux, we must stop believing that we have a monopoly on the definition of taste,” he says. • This is funny. And so is this. This entry was posted in Uncategorized and tagged Coke, iPad, Michel Rolland, technology. Bookmark the permalink.